Quaking Aspen Clump This tree is an ‘Idaho Preferred’ Plant. 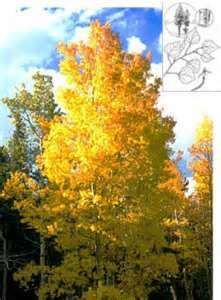 Quaking Aspen has a pyramidal shape when young, rounded when mature, heart-shaped leaves that turn yellow in the fall. This rapid-growing tree is frequently planted along streets for windbreaks and screens. Fast growth rate. It is native to our area. 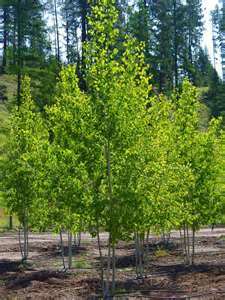 Quaking Aspen will tolerate wet soils and it is also a Firewise plant. Use Prune Smart on any suckers. Grows best in full sun to lite shade. Beautiful Fall Color graces our valley.